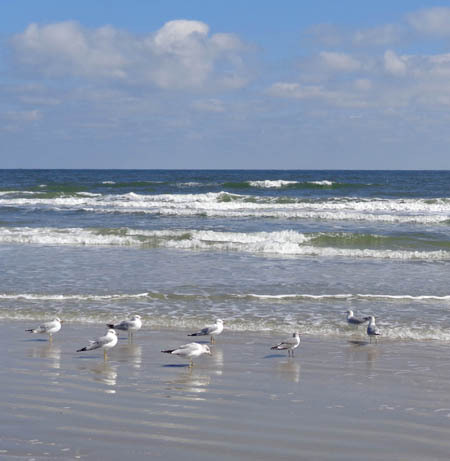 biking, historic mansions, wild horses, loggerhead turtles, and much more." What a great place to spend the day -- or several! This national park covers 36,000 acres of pristine maritime forests, wild beaches, freshwater lakes, and saltwater marshes. 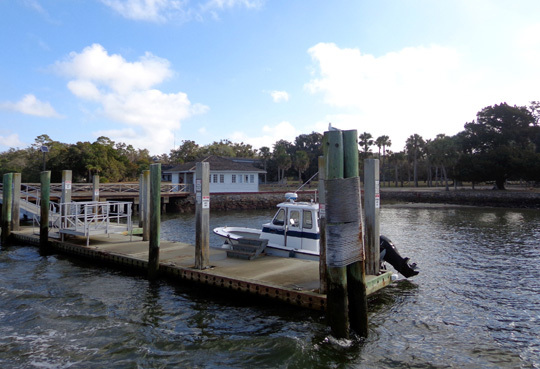 The island is about seventeen miles long and ranges from about a mile wide at the south end where the ferry docks to about three miles wide farther north. 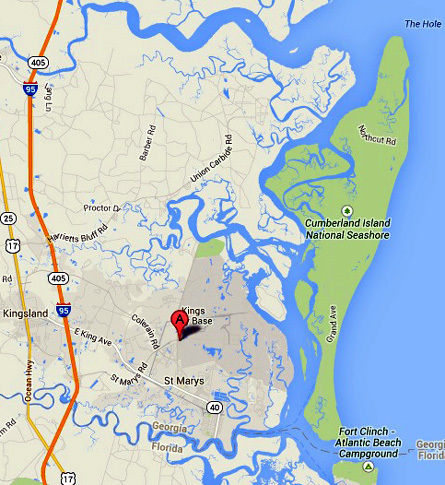 It is separated from the mainland by several miles of salt marsh and the Intracoastal Waterway. You can see a detailed map of the island here. 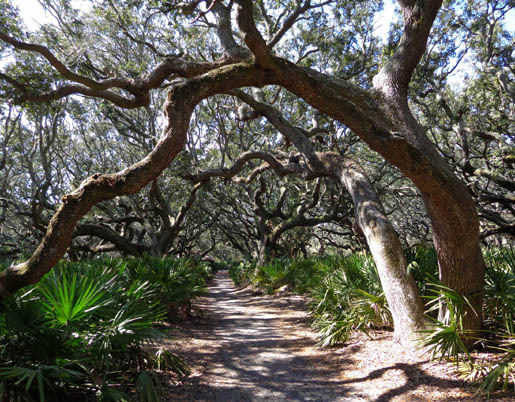 Photography: lots of things to photograph on Cumberland Island! I took over 300 digital photos in one day and could have easily taken even more. 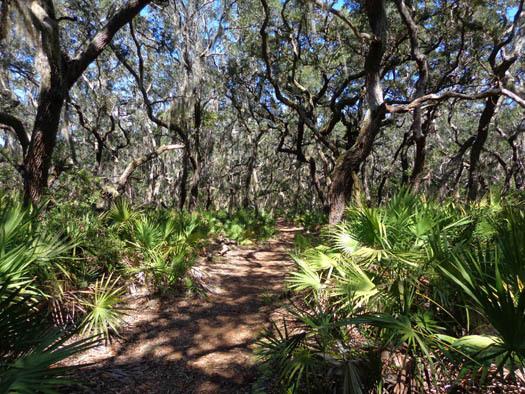 About 80% of Cumberland Island is National Park property, providing the fragile natural habitats with a means of protection and preservation. The park service limits the daily visitor rate to only 300 people for this reason. I'll begin this entry with general information visitors need to know before a day or overnight trip to the island, then take you on a virtual tour of the southern end of the island. That's the part most day visitors see on foot. There are four pages of photos to tempt you to visit the island! Support our national parks . . . 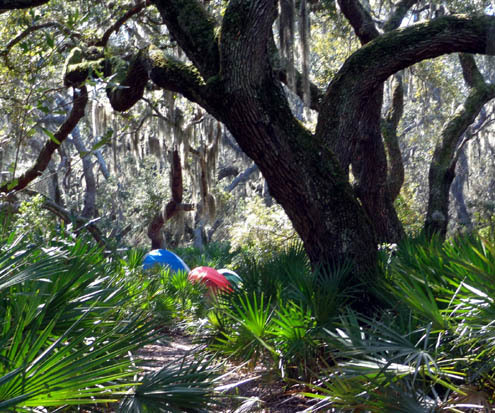 Whether you live on Cumberland Island, work there, or are visiting, the only access is by boat. There are no bridges to the island or airstrips where you can land a small plane. 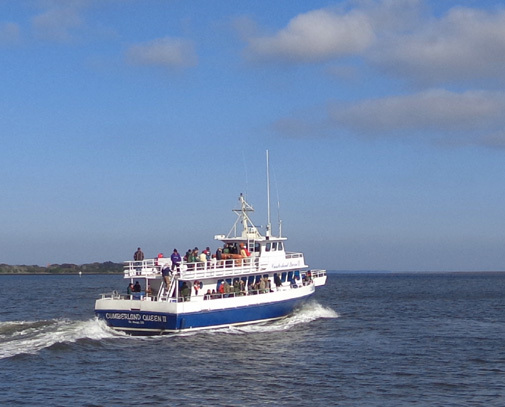 If you don't have your own boat or want to pay big bucks for a charter boat ride, the standard way to get there is to take the Cumberland Queen passenger ferry from St. Marys, Georgia. The ferry doesn't allow vehicles, bikes, kayaks, or pets. 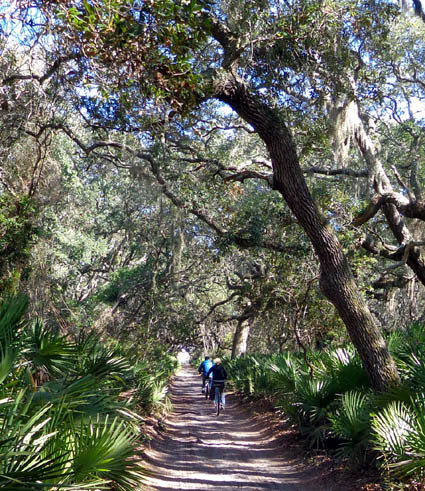 For most visitors, Cumberland Island is a day trip and not an overnight destination. Overnight accommodations run the extremes -- either bare basics or an elegant inn. There is nothing in between like a cozy cabin. 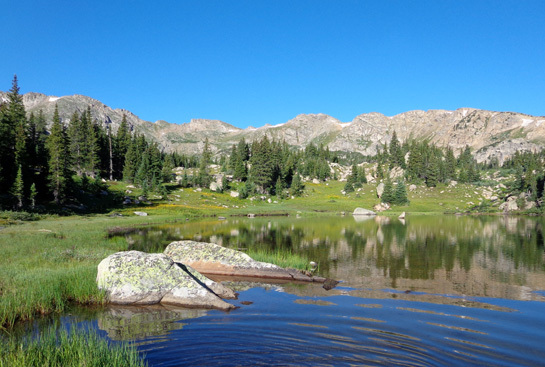 Tent and backcountry camping are allowed in four different campgrounds for up to seven days at a time and must be reserved in advance. Guests may also reserve a room at the privately-owned Greyfield Inn. I assume the Inn provides transportation to and from the Sea Camp dock, which is over a mile away. There are no restaurants, concession stands, or even drink dispensers on the island. Day visitors and campers must carry everything they need while they are there. I saw water fountains at the Ice House Museum, Sea Camp Beach campground, and the ranger station. Some snacks and drinks are available on the ferry. Overnight guests at Greyfield Inn get meals. There are restrooms near Dungeness and at the Sea Camp campground. On my day trip I wore a backpack with enough fluids and food for eight or ten hours, a rain jacket, sunscreen, sunglasses, camera, cell phone, toilet paper, and plastic bags for shells and trash. Once on the island, transportation is practically non-existent for visitors, including campers. Word to the wise: wear good walking shoes. My trail running shoes were fine for everywhere I went today. It's OK to put some sandals in your pack for the beach but they aren't very practical for walking on the sandy roads or trails. The only vehicles allowed on the island belong to the park service, the Greyfield Inn (a private concessionaire), and the few residents who own private property there. Visitors must walk everywhere they go unless they want to rent one of the clunky old bikes at the Sea Camp ranger station. I've heard they are difficult to pedal on the soft sandy roads but they are an option for strong people to explore farther north on the island (the ferry docks at two places at the south end of the island). 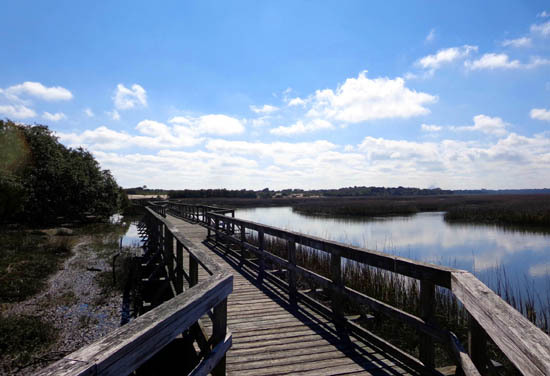 Bikes aren't allowed on trails, boardwalks, dunes, or the beach. Even the main road is only about twelve feet wide and sand/dirt. The only pavement I saw after hiking eleven miles today was around some of the buildings (ranger stations, bathrooms). One of the things I like best about Cumberland Island is that there are very few vehicles on the roads, so they are a great place to walk. I saw only a few bikes or motorized vehicles on the roads today and I relished the solitude. Note that the park service has a Lands & Legacies tour that takes visitors to the northern part of the island in a van that holds about a dozen people. 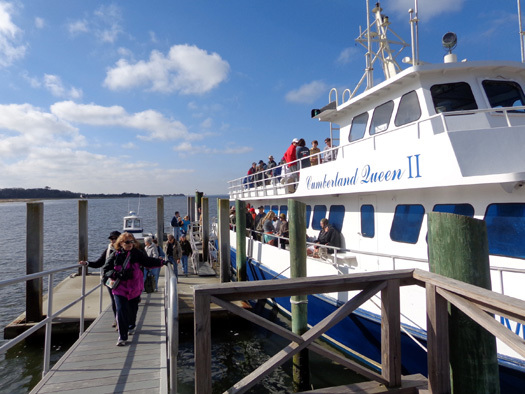 The tour is described as a rugged, all-day trip requiring a fee and an advanced reservation for the tour as well as the ferry ride. 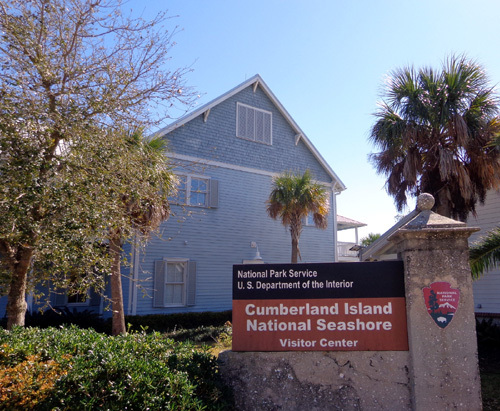 Although I visited some of Georgia's other barrier islands during the 25 years I lived in Atlanta I never got down to Cumberland Island. Visiting the island was one of my goals during this winter trip. I've just been waiting for the right time to reserve a spot on the ferry -- a warm, sunny weekday. 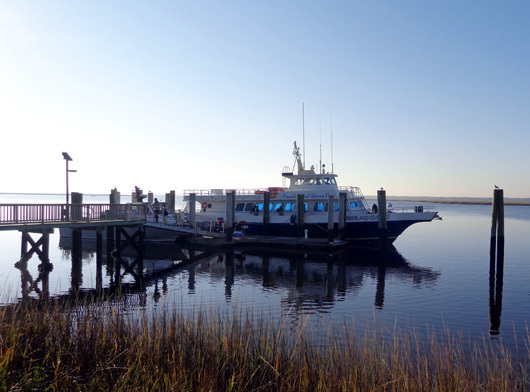 A ferry reservation is advised anytime you want to visit Cumberland Island, even on a winter weekday. Because demand is lower in the winter, the ferry schedule is reduced to fewer days and times in December, January, and February. For that reason it's almost as difficult to get a spot during those months as in the other warmer ones. Like airlines, the ferry company tries to keep the ferry full each trip to be more cost-effective. As you'd expect, warm, sunny days and weekends fill up first. You can make ferry and camping reservations up to six months in advance but you're taking a chance on poor weather if you do it more than a few days in advance. That may not be a serious problem in the summer but you can expect some cold, wet, and windy weather in the winter that could make your experience less than optimal. Since we're staying nearby all month I had the luxury of waiting to see what the weather predictions would be for several days in advance, then sprang for a reservation. I went alone because we can't leave Casey-pup in the camper all day and Jim isn't able to walk very far. 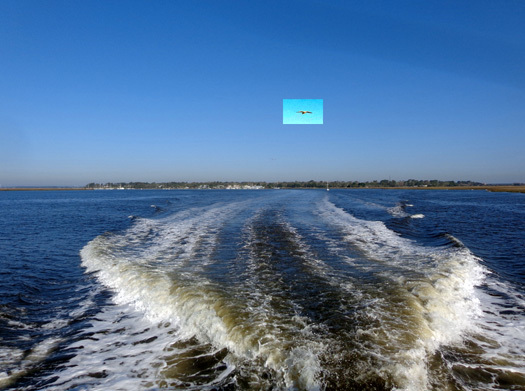 A sea gull follows in our wake. Is he posing, drafting, begging, or just having fun?? Earlier this week the forecast for today (Friday) looked great -- sunny, 60s F., and not a lot of wind. I decided to get a reservation for the first of two ferries leaving St. Marys (9 AM), with a return trip at 4:45 PM from the Sea Camp dock on the island. There was a second ferry leaving St. Marys at 11:45 AM but I wanted to spend the whole day on the island. The National Park Services contracts with a private company to do the reservations and run the ferry. I didn't find the reservation process over the phone to be particularly efficient or user-friendly but check-in was fairly efficient and I enjoyed the whole experience on the ferry outbound and back. Jim took me to the National Park Service Visitor Center at St. Marys this morning and went back to get me later. That way he had use of the truck all day. My reservation was for 9 AM. Folks riding that ferry are required to get their tickets at the visitor center before 8:30 AM, then attend a brief orientation before boarding the ferry. I had already paid for my ticket but had to sign in, pick it up, and show my NPS senior pass (if you don't have a pass, there is also a small fee for the park). 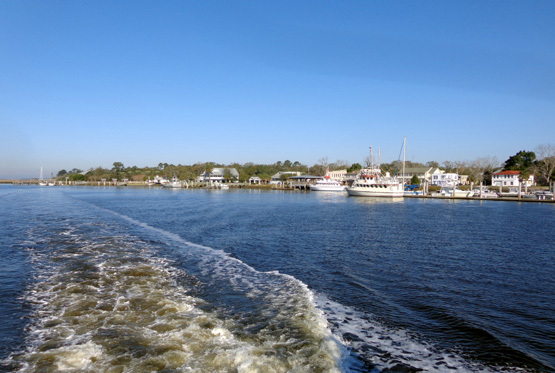 It is about seven miles east and north on the St. Marys River and Intracoastal Waterway to the first dock at the Ice House Museum AKA Dungeness Dock. There is another dock (Sea Camp) a mile farther north. The majority of passengers, mostly campers, got off there. I left from that dock at 4:45 PM. There are some tables with bench seats inside the ferry but I never went in there. I wanted a good view of the scenery so I could take pictures. I rode outside at the back of the ferry on the top deck outbound and stayed outside on the bottom deck on the return. I had enough clothes on to stay warm there and on the beach, where it was more windy. It felt quite warm when I was on the trails and roads in the forest. I wanted to explore the Dungeness Ruins first so I got off at the Ice House/Dungeness dock. Ranger Rene, who gets to her job on the island on the same ferry the other passengers ride, gave us a briefing at the dock. 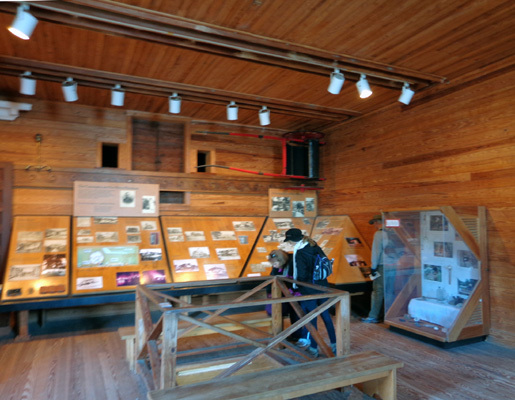 Then she unlocked the Ice House Museum for us to tour on our own. The Ice House Museum is in a fairly small building near the dock. Beneath the building is a tabby foundation dating back to the 1830s, when one of the plantation owners, Robert Stafford, operated a general store here. Later the Carnegie family built the current structure. Until there was refrigeration and electricity on the island, hunks of ice were shipped down to the Carnegies and other landowners from Maine and stored in the ice house. 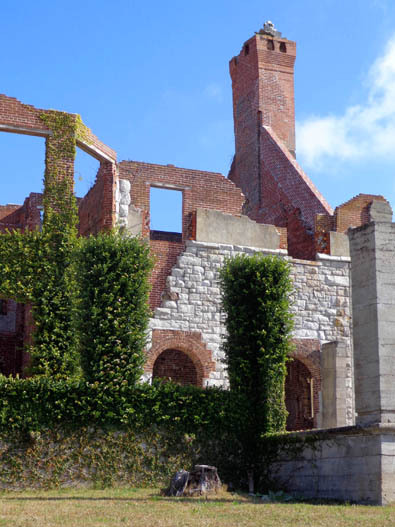 I didn't mention this earlier, but 90% of Cumberland Island once belonged to the wealthy Carnegie family. They donated most of it to the National Park Service in the 1970s. 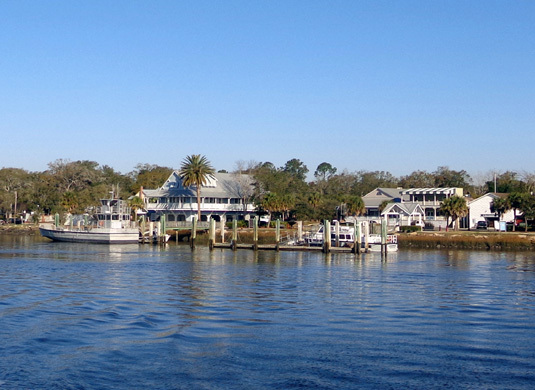 The mansions on the island are ones they considered as "summer cottages." Dungeness is in ruins but Greyfield, Plum Orchard, and some smaller buildings are still intact. 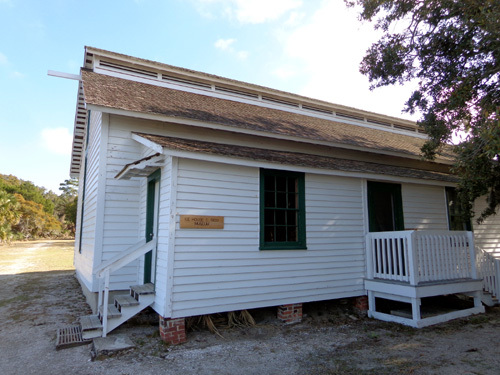 Some are used as park service offices or housing and some like the ice house are open to the public.